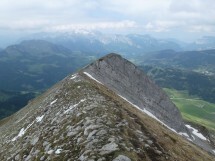 On next Sunday, June 26, if the weather is nice, I am organizing a hike to crossing the Merdassier 2313 m. This summit in Aravis center, offers a magical view over all surrounding and distant Alps. We start from Coverie (Clusaz). Through the fields and footpath we arrive at Belvédère and go up to the summit. Crossing a pass to arrive at the Grand Chamois ridge. Down the ridge and via a nice trail arrive at parking. Accumulated elevation gain around 1050 m. Distance about 10 km. Normally there is not major difficulty. But the pass between principal peak and the ridge is slightly aerial. Equipment: Good mountain shoes, hat, gloves, warm and waterproof clothes, picnic, drink ….